Another year comes to an end. It was a year of exploring different places, discovering new creatures and new life, and gaining knowledge based on the memories and the experiences built over a few years. It was a long year, and I began learning many more things that I seemed to overlook in the past. And the curiosity started ever increasing as I looked in the dry thickets during autumn, when everything was slowing, distant and well hidden from sight. It is winter now, about time to bid farewell to 2009. The year had been warm and the snow far too less. The ground would have been covered in a foot of snow around this time they say, and when I look out through the window, there isn’t much snow at all. There, through the window I did see flakes of snow lingering in the air. The air itself was thin and fair, and the weather old and cold. The trees were bare and except the conifers, only flecks of little grass were green. The landscape is dominated by skeleton of trees, and brown somber suburban houses are lined in a monotonous way. There are empty roads, frosty cars, and there is the sky bleak and gray, weighing lowly on the skyscrapers. It is winter for real without its white cloak. As I looked at this still urban landscape, scanning the trees near and far, and gazing at the sky – I saw a lone Mourning Dove sitting quietly on the parapet. It seemed oblivious to my presence at first; hence I took the opportunity and photographed it through the window. The air was getting colder and snow wilder, yet the dove sat unstirred, only shuffling its feathers – trying to be cozy and ready for another cold day. So I went outside, slowly so, and once the dove saw me, it never took its eyes off me. Approaching birds for photography is a risky task. 99% of the times, it never works and if the bird is very wild, the chance of approaching one is only 0.01% unless you are extremely well camouflaged or they come to you! This staggering probability of photographing a bird up-close and personal is further dimmed if you use a point-and-shoot camera! But I took the chance of photographing this one in the backyard, hoping that the temperature was not very low to affect my point-and-shoot’s working (my point-and-shoot manual does not recommend the cam to be used in sub zero temperatures), so keeping this in mind, and after several decent shots through the window, I dared to step outside and approach this bird – recalling the probability of disturbing it. Yet, to my surprise, after I opened the door – the dove, albeit staring at me all the time, did not move a bit! I took a few shots, and stepped outside, closing the distance between us one step at a time. It did not seem any comfortable and I was afraid I might cross the line of tolerance. He looked, took the alert pose by bending lower, getting ready to fly away. I, after noticing its unwillingness to greet me from close, stood there for a moment. This fellow dove must have thought I’m persistent, as I started approaching cautiously again. Surprisingly he seemed pretty relaxed and shuffled and played with its feathers thereafter! I was relived myself, and took some shots from nigh ten feet! I experimented with the shutter speed and managed a few decent shots at 1/80s by taking the support of the deck. The light was utterly low, which was a challenge for using a point-and-shoot that gives high levels of noise even at ISO 200! I backed out after some shots, and was successful in not disturbing it. The dove continued to sit there for some time and flew off as dusk approached. The backyard is now empty, only the wind plays with the bare branches of maples and apples, and the weakened grass. But oft, there comes a feathered visitor to peck in the garden and in the snow. These are the ones that give a merry company, as I watch them through the window once in a while. The fauna of this season is much colorful than I thought, and I always pictured winter to be a season where life is still, but the birds and squirrels are ever joyful, and bring delighting warmth that the weather lacks. Since all these birds are new to me, I took help of David Beadle to identify these birds, and relied much on the internet. 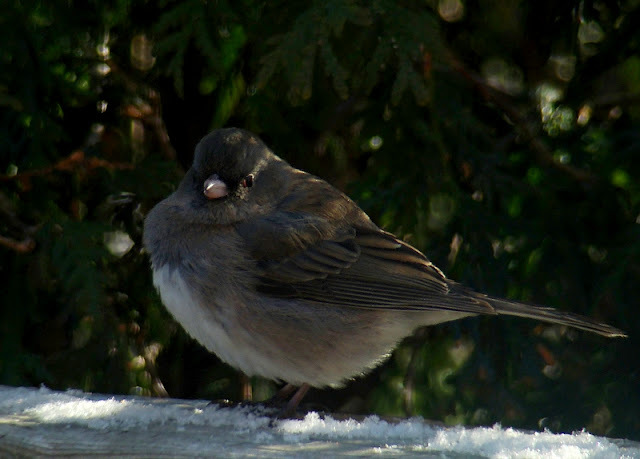 One such – and the first – bird I observe over a few days is the Dark Eyed Junco. 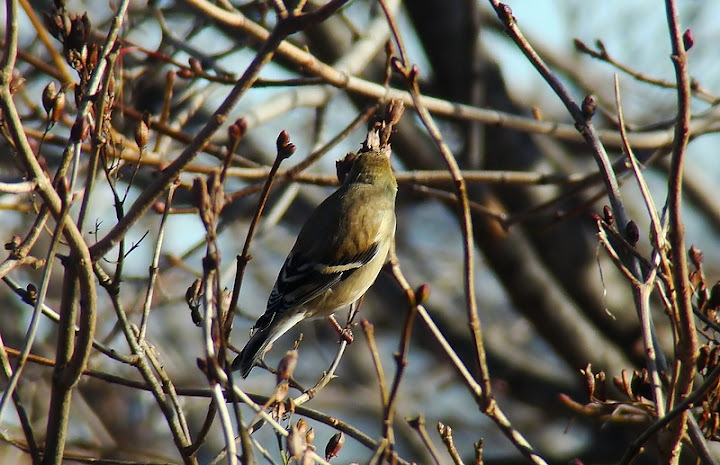 It is a resident throughout winter, and is common at birdfeeders. These come in little flocks of around ten, and fly around together from one tree to another. There is no birdfeeder here, and I have seen them pecking in the dried thickets and in snow. The males are conspicuous with a slaty blue color, a pinkish beak and a white belly, the body is round, a little smaller than a House Sparrow. The females are brownish and are easily distinguished from the males. The flocks have several males and females, and I have not observed any juveniles yet. 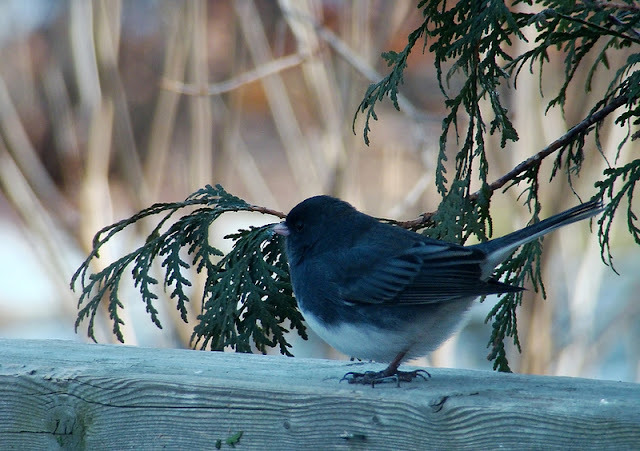 The Dark Eyed Juncos are relatives of American Sparrows and are very commonly seen in the backyards. 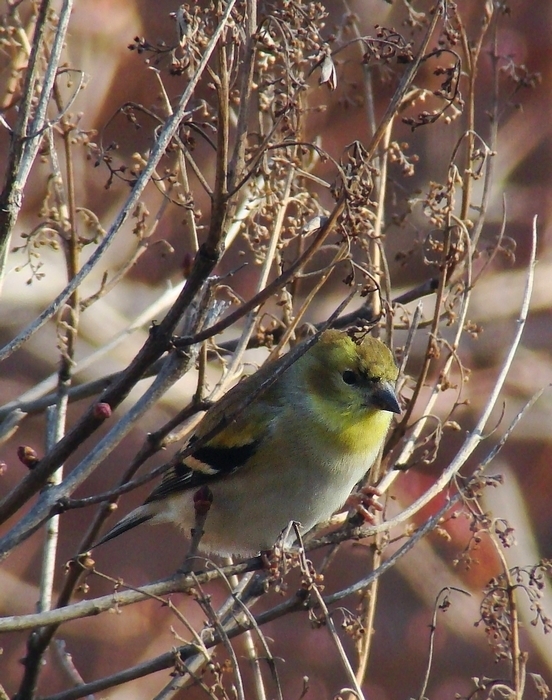 The second flock of bird that visits often is of Goldfinches, having shed their brilliant plumage; they cloak themselves in subtle shades of yellows – the winter plumage, and go around in small flocks from one garden to another. They are second most commonly seen birds around, and are a delight to watch. I have seen several feeding on dried seeds and from the inside of the pinecones. The flock seen here is that of more or less seven individuals, and these are also said to be common at birdfeeders. Along with this flock comes a lone finch – either a Purple Finch or a Common Finch, which I have failed to photograph yet. Once in a while I sight a few Black Capped Chickadees jumping swiftly from one branch to the other. They are not as common here as I expected, but it maybe because I’m only looking through the window. They are not as patient as the other birds described here, but are a bunch of joys to watch. Another, conspicuous yet elusive bird is the Northern Cardinal, this fellow resident male here is seen in its winter plume, and is just a speck of red feathers flying around the backyards. Sometimes the female shows up, and they both sing in chorus in the pine trees, hiding well inside, well protected from the cold winds. There was also a lone American Robin that visited the backyard and perched on the bare Maple. An interesting visitor here was an Acipitor, a hawk. The identity of whom is uncertain – it is either a Sharp Shinned Hawk or a Cooper’s hawk juvenile. 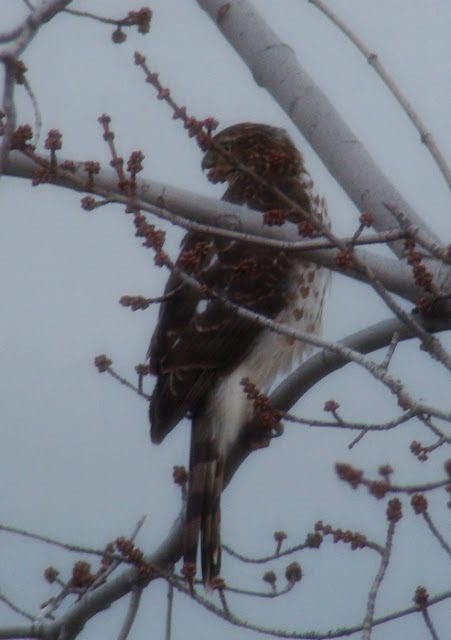 It was only once that I saw this beautiful hawk, as he swooped in from the adjoining backyards. What a sight it was! The two probably names are debatable, but both are bound to be seen around feeders. David Beadle suggested it to be a Cooper’s hawk – a bird more commonly sighted in the backyards during this year than Sharp Shinned Hawk. 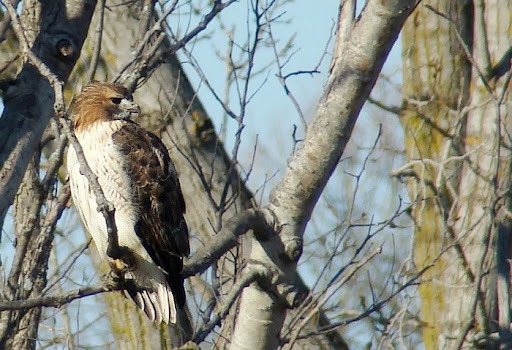 Another raptor that I was lucky to see perched on a tree was a Red Tailed Hawk. It is one of the most widely spread birds of prey in North America. I have seen two of these fly around, probably in a territorial dispute in London ON. Because of its robust crispness, a certain recording of the cry of the Red-tailed Hawk is a cliché cinematic effect. This high, piercing scream is often featured in the background of adventure movies to give a sense of wilderness… the cry is often inaccurately used for Bald Eagles, whose own vocalizations are quiet different and less robust. The ever present Eastern Gray Squirrels are always seen running o’er the parapet and on the trees, and I always see a supposed pair of a gray and a melanistic squirrel chasing one another. There are several individuals of both forms, with the melanistic being more conspicuous during this white season than the gray ones. They are wary as ever, yet watching them through the window is the best I can do, without disturbing them. A pair, I have been observing for a few days are always on a look out for each other. Most times it is the melanistic one chasing the gray squirrel, no idea whether it is the male, but that’s my assumption! When there were none of these around, there were gulls flying high above in the skies, be it during a snowfall or during blinding sun. These high flying gulls were probably looking for food inland, and are a usual sight at garbage dumps and outside malls to pick up from the scrap. These water birds turned scavengers sometimes harass the pedestrians and are noisy, sometimes they scatter the garbage but most times they are just enjoying themselves. All these animals discussed here are common during this season, and their company is welcoming during bleak winter days. All of them also share a “Least Concern” status of conservation according to IUCN, but that does not mean they are out of danger. The dangers include natural causes such as snow storms, for which these animals are well equipped, thanks to the million years of evolution. The anthropogenic dangers faced by these are electric shocks from cable wires, loss of nesting and hibernating places and basically loss of habitat. But one of the overlooked dangers is that caused by birdfeeders. This interesting article - Feeding Birds shown to impact their Evolution will give you a deep insight in how we, in belief of being courteous to the birds, might affect their evolutionary patterns. The article is worth checking out, which does not state that birdfeeders are a bad thing, but explores the hidden cons that the birds may face in the future generations. Although I believe that birdfeeders are like an oasis for the birds and squirrels and their predators, it is also a best site to photograph the same. Albeit all of this, when it comes to photographing these wild birds who are adjusting to the man-made artificial habitat, it is not as enjoyable as chasing them in the wild – or just watching them go around as they naturally would, even if it means staring through the window. Seasons greetings and a happy New Year to you all!